Used by some therapists to treat liver disease. Offers potential in preventing asthma attacks. 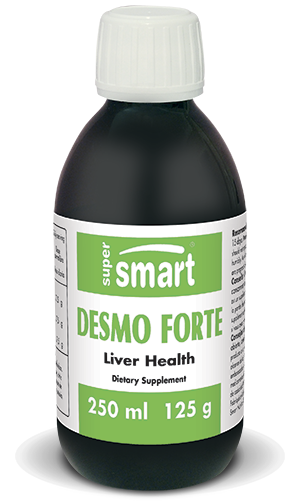 Desmo forte™ contains a 1:2 liquid extract of Desmodium adscendens, a herbaceous plant originating from equatorial Africa and Latin America. For centuries, traditional healers and doctors have used extracts of the plant to treat various ailments, particularly liver diseases, such as hepatitis, and asthma attacks. ¤ Introduced into Europe by French doctors who discovered it while working in Africa, Desmodium adscendens is now used by certain therapists to treat liver diseases. ¤ Desmodium appears to produce rapid results in acute viral hepatitis accompanied by symptoms including jaundice, asthenia (weakness) and modified biological parameters such as transaminases. The jaundice and asthenia disappear within a week and biological parameters return to normal within 2 to 4 weeks. A study of 32 cases of acute viral hepatitis show that Desmodium's effects are rapid and permanent as long as the disease is treated promptly, within a few days of it presenting. Treatment is less effective when started later, although there are still effects on biological parameters. It seems that early treatment prevents the disease from becoming chronic. ¤ A study of 47 patients with hepatitis B, conducted at the Bamako Hospital in Mali, showed that Desmodium resulted in a rapid reduction in jaundice, transaminases and bilirubin. In almost half of patients, biological parameters improved within 45 days of being treated. In a preliminary clinical trial in Italy of 41 patients with hepatitis C, Desmodium produced signs of improvement in liver function in 58% of cases, with no effect in 26%. ¤ During chemotherapy, deterioration in the liver can occur, signified by transaminase levels; Desmodium appears to produce improvements. ¤ In Ghana, traditional healers use Desmodium to control asthma attacks. Animal studies conducted to establish Desmodium's mechanism of action in these cases have shown that Desmodium has a relaxant effect on the smooth muscle of the lungs and that it inhibits the contractions and constrictions caused by the release of substances during allergic reactions. Other ingredients: glycerol, potassium sorbate, sodium benzoate, citric acid. Once opened, consume within 15 days. Take one 15 ml dose of Desmo forte™ a day.